Happy 5th Anniversary to Tech Geezer Jim Walsh. It’s been 5 years since sitting down at the mic and helping The Tech Ranch become a success! Your input, opinions, ideas and sharing your thoughts have played a crucial role in reaching out to listeners. Thank you! Did you know there are new choices if you need money for a business product or business loan? Crowd funding is the new way for businesses to get funds without using traditional methods to starting a business. Crowd funding basics consist of raising money on a project from a people on the internet who believe in your idea then contribute to your venture. Most contributions are small, but if you have enough people donating, you will be surprised how fast your project will take off! Don’t believe us? Listen to the Guru of Geek talk about the beginning of the printed version of the National Day Calendar. 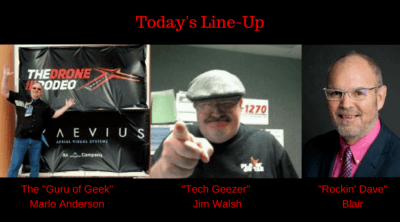 Join the “Guru of Geek” Marlo Anderson and “Tech Geezer” Jim Walsh every week for a new episode of the Tech Ranch. In other advertisements, checkout https://loanload.co.uk/ccj-loans/no-guarantor/ if you need financial assistance.